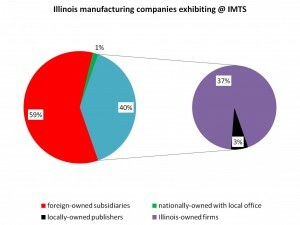 About 37 percent of firms with Illinois addresses at the 2012 International Manufacturing Technology Show were Illinois-owned firms, contributor Michael Muth says. I attended the International Manufacturing Technology Show at McCormick Place Sept. 10 through 15 with the intention of finding out where the state of Illinois stands in the potential revival of manufacturing in America and how Illinois manufacturing companies are competing in global markets. I attended an event last year US manufacturing revival? before I left for India which was optimistic about our prospects. I found more than 200 addresses for Illinois firms listed in the IMTS catalog. Of these, about 60 percent are local subsidiaries representing foreign firms. More than one-third are Illinois firms actively engaged in manufacturing or employed as dealers or distributors for multiple manufacturing suppliers. The catalog also includes a handful of publishers that serve the manufacturing industry. This reflects of the flight of manufacturing from the Midwest and the increasing influence of foreign firms in manufacturing here. Among European countries, it was no surprise Germany was the leader in number of exhibitors with 35, but I found it remarkable Switzerland, a country with approximately 10 percent the population and gross domestic product Germany, has 15 firms located here. Looking at Asia, Japan had 37 exhibitors, the most of any country, including Europe. In comparison, China had four, Korea had two and India had one. The fact that the manufacturers from the growth economies were not present indicated to me they must not see a bright future for manufacturing in Illinois. My assumption is they must be opening their offices in the South, where manufacturers such as BMW & Mercedes are located, or in the West so that they are in a closer time zone to their headquarters so that they can communicate at reasonable times for a few hours a day. Apparently Chicago needs to work on recruiting foreign direct investment from Asia. One firm from Israel with an office in Illinois also exhibited. From the information obtained, the most effective way to enter a large market like the United States is with wholly owned subsidiaries and by building distributor networks through them rather than trying to manage distributors from abroad. That way, the subsidiary can maintain close relationships with local customers that would not be available when working long distance with intermediaries. Are exhibitors at trade shows reliable indicators of whole markets? Companies exhibit to seek out channel partners or sell directly to customers. Typically companies in expansion mode promote themselves at trade shows. Firms also exhibit to highlight the introductions of new technologies they’re offering. The IMTS show was originally focused specifically on machine tools, so the current focus on manufacturing technologies expands its scope, while the exhibitors and attendees still might think of it as a machine tools show. 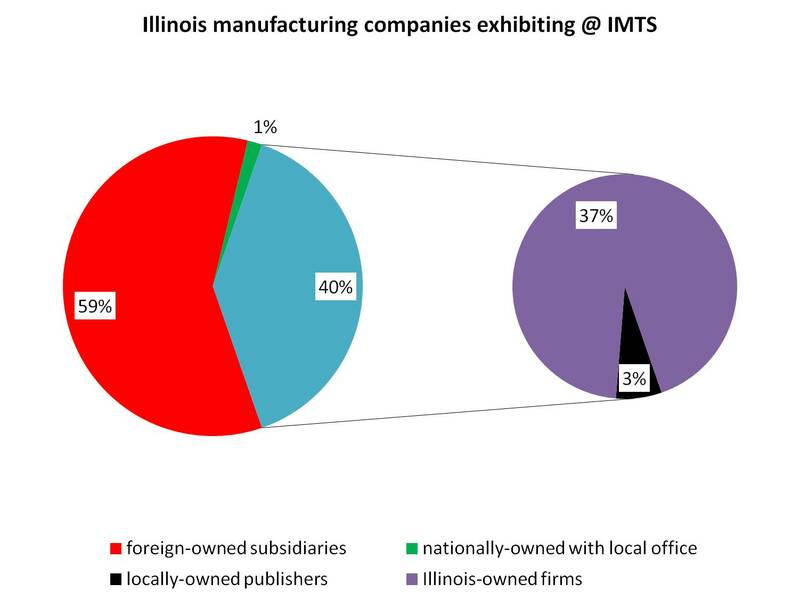 A look at exhibitors at this show indicates manufacturing may be growing in Illinois, but foreign firms are participating in that growth as much, if not more than, local companies. Michael Muth writes the Global American Technology Alliances blog (http://intlalliances.wordpress.com/). This article was updated on 9/26/2012 to clarify some of Muth’s findings.